50% Student Discount at I Saw It First No need to break the bank when you've got books to buy! Get 50% off plus free delivery when ordering at I Saw It First! Premier Delivery for £9.99 at I Saw It First Get all your delivery sorted in advance with unlimited next day delivery for just £9.99 for the year! 75% Off Dresses in the Sale at I Saw It First From minis to midis, get up to 75% off dresses in the sale at I Saw It First! Discover £36 Off Accessories in the Sale at I Saw It First Accessorize for less when you shop with I Saw It First. £5 Off with Friend Referrals at I Saw It First If you tell your bestie about I Saw It First, they'll get 40% off their first order and you'll get a £5 off your next order! Get £52 Off Jumpsuits in the Sale at I Saw It First These deals will have you jumping for joy! (yes, pun intended). Place Your Order by 8pm to Get it Next Day at I Saw It First Order by 8pm to get your order delivered the next day! Find £45 Off Knitwear in the Sale at I Saw It First The sun may be poking his head out a little more, but don't be fooled, you'll need your knitwear for longer than you think! Now you can get it for even less at I Saw It First. 75% Off Shoes in the Sale at I Saw It First Step up your style game and get up to 75% off when shopping for shoes at I Saw It First! Outlet Orders from £1 at I Saw It First The Outlet has now launched at I Saw It First! Shop the mega savings to be made with items from as little as £1! Enjoy £35 Off Trousers in the Sale at I Saw It First With styles to suit all, you don't want to miss these great offers. Want to find hundreds of styles and endless looks before everyone else? Now you can at I Saw It First. From the perfect dress to your next favourite pair of heels, I Saw It First is one of the fastest growing fashion retailers in the UK, and it's doing a swell job of keeping the fiercest of fashionistas bang on trend. No matter what your budget, amazing clothes, shoes and accessories are available for less from the ever-expanding catalogue. Sports luxe, bohemian chic and going out glam are just some of the looks that you’ll be able to conquer with vouchercloud by your side for seriously stylish savings. With new styles added daily, whether you want casual clothes, work wear or jewellery, you'll be able to see it first at isawitfirst.com. How do I use my I Saw It First discount code? Scroll through all of the current discount codes for ISawItFirst.com here on vouchercloud, choose your favourite and copy the code of your choice. Follow the link through to the I Saw It First website and browse through the endless collections of must-have fashion. Add your favourites to your bag and when you’re ready, continue to the checkout. Enter your chosen discount code in the space on the right-hand side. Your discount will be deducted from your total. Stay in the know and subscribe to I Saw It First with your email for the latest offers and new trends. For even more exclusives, check out their WhatsApp! Does I Saw It First do student discount? Do I Saw It First offer gift cards? Treat your best pal to an I Saw It First spree with a gift card. Purchase one from as little as £10 to £100 and it will be sent to your email address for you to share with your friend. How can I get I Saw It First free delivery? I Saw It First often offers free delivery, so keep an eye out on vouchercloud for the latest free delivery deals. Free Unlimited Next Day Delivery for an entire year is available for £7.99, simply purchase Premier Delivery. What are I Saw It First sizes like? You can use the I Saw It First size chart to access accurate information online if you're unsure about which size to order. Do I Saw It First have a sale for Black Friday? Keep an eye on vouchercloud for exclusive I Saw It First Black Friday deals. International prices vary see the I Saw It First website for full details. Contact I Saw It First by filling out their contact form. Bringing you nothing but the freshest fashion and pop culture styles first - it’s in the name at I Saw It First. This is a world where drab and outdated clothes don’t exist, and your I Saw It First discount code is a one-way ticket to a sensational wardrobe. Fierce co-ords will have you looking fabulous, while tops and dresses for all occasions will give your look and confidence that boost it needs. I Saw It First, but this is one secret we’re happy to share! When you venture into the I Saw It First blog, you’re bound to up your style a notch or two. Full of the latest fashions and seasonal trends, this is the easiest way to vamp up your wardrobe. You’ll get inspired for your next stunning look within seconds, as you go behind the scenes with the I Saw It First crew and simply stay ahead of the times with regular glamourous updates. A dress is a safe haven and can be relied upon for every event. 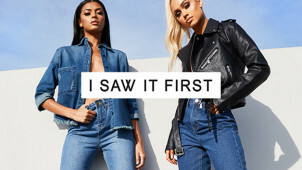 An impromptu date or last minute hang out with the girls won’t leave you in a clothing twist now that you’ve got an I Saw It First promo code for you to suss your look out with a fabulous dress. Lacey numbers feature highly, while if it’s a day dress, bodycon or even skater number that you’re on the prowl for - you’ll see it first with this starry retailer.